Provide high-quality, cost-effective primary health care to anyone regardless of income or insurance status. East Hill Family Medical (EHFM) wanted to develop a fundraiser that would increase awareness of EHFM and their services, raise money, and promote healthy living. EHFM sought the services of Crème della Crème Copywriting & Communication to develop a fun, community-centered event and design all of the associated materials. They requested that the event and design focus on movement, the human body, and the local community. 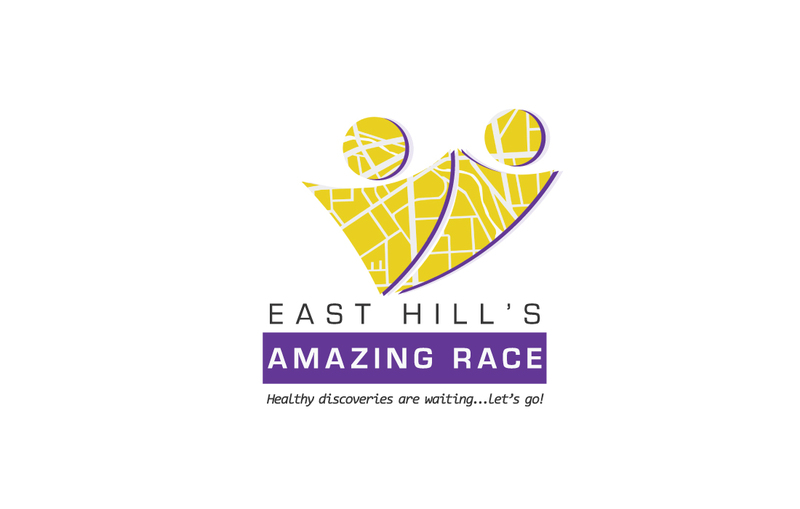 The East Hill Amazing Race logo is a unique design that hints at the TV show the event was based on. The yellow color is found throughout the TV show and the block purple square is reminiscent of the famous clue cards. The people in the logo represent the teams of two competing together for the fastest route time. The map for the event was representative and symbolic of a healthy body and community connection. It also featured various downtown Auburn locations, emphasizing the importance of the local community.